My Milestones Memory Box from mushymoments, a parent - owned design company crafting cool gifts on the Northern Beaches of Sydney. Capture baby's big milestones, from their first day in the world to their first birthday, and all the fun in between such as first steps, first tooth and even first haircut! Take a picture of baby with their stunning milestone card, designed with a blend of fun and love, reflecting the joy we feel watching baby grow. Notes section on the rear of each card allowing parents to look back and recall the moments in detail and even leave a message for baby to read! Comes with a cool, folded modern A3 size infographic chart. Fill it in as baby grows, frame it to make an amazing chart of your little one's development and personality, created in real time, that can be displayed on your wall for a lifetime. All of this is contained in a specially designed solid keepsake box which will not only keep your memories safe, it also looks great; allowing you to keep these special memories where they should be; on display and free to be enjoyed by you, family, friends and even baby, forever. Three gifts in one. The premium baby cards gift set. The only milestone cards that come packaged in a timeless keepsake box which creates a treasure chest for baby's first year. Don't let memories slip away. Remember every detail and date of baby's milestone moments - Our cards have space on the rear to make notes. Store them in the keepsake box to create a diary of baby's development. Create a photographic diary to keep forever. 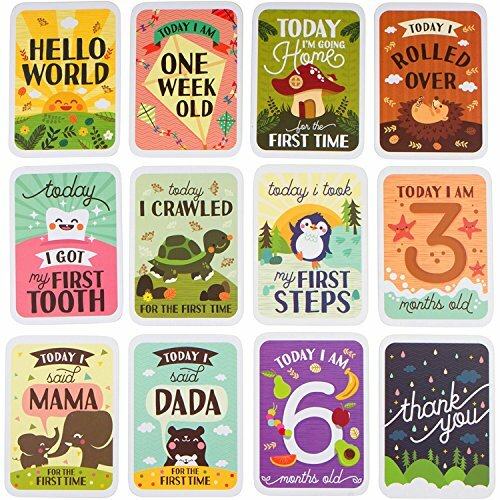 Take a photo of baby with their milestone card, share with friends and family, print and remember how your baby was at each stage of their first year. The charming gift box doubles as a baby photo album where you can store your photos. Use the special Thank You card to send a photo message to friends who have sent baby gifts. If you have any questions about this product by mushy moments, contact us by completing and submitting the form below. If you are looking for a specif part number, please include it with your message.